As you know, there's a lot of free marriage advice available to couples, particularly on the internet. Since the majority of marriage advice you'll get is from family and friends, you'll most likely narrow down what you're willing to hear, to the people you respect most. Let's suppose your uncle who often finds himself propped up with adult beverages, gives you marriage advice that sounds like, "Lookit. Ya gotta get smart and jus do what I do. Keep yur mouth shut and just say uh hu, ya, you bet, to anything she/he says. THAT's how you stay married." Certainly not much help, but even sober opinions from the personal experience of several family members probably won't qualify as the best marriage advice you'll ever get. It will be limited to their own experience with their own marriage, or in many cases marriages. So as we look past the limited viewpoints of friends, family and coworkers about marriage, we move out to people who make a living talking with married couples in crisis. These people are more objective and have seen a lot of married couples so they probably can give better, or at least more objective marriage advice. We start with marriage counselors. Marriage counseling has been around as a profession for the last forty years. When a profession has been around THAT long, you'd think they would have figured out the best marriage advice of all. But unfortunately, the profession started out on the wrong foot. They began with the belief that people needed to talk about their problems in order to find a solution. The odd part about this is that it has proven to be wrong. The more couples talk about their problems, the more problems they believe they have. As a consequence, many marriage counseling and couples therapy sessions have encouraged, rather than discouraged divorce. Because hot emotions intensify in these sessions, the couples stomp out the office, one spouse feeling validated, the other feeling the brunt of the blame. But ultimately, the couple will never return. The majority of marriage counselors, as it turns out, are really therapists who enjoy talking to one individual. That's where they find their real calling. Let's look at another form of marriage advice; self help authors and life coaches. These people often work by telephone coaching groups, couples and individuals on pretty much the gambit of living what they call a successful life. The field is too new and disorganized to give these individuals any kind of rating system, so you just have to look and see who you like by reading what they write, watching their video's, reading their blogs, etc. In this world of life coaching, there are many opinions as well, but these people have decided to get into this growing field because of their own life experience. Now here the problem becomes who can you trust? I'm going to assume that you want the best marriage advice you'll ever get, so what would that be and who would this advice be aimed at? There are two audiences for the best marriage advice you'll ever get. 1) People who are not married but want to be. 2) People who are already married. Both of these people can't have the same answer, so let me separate my responses, starting with the not yet married. NOT YET MARRIED BUT WANT TO BE: You may have previously been married but lost your spouse through death or through divorce, but you are now in a place where marriage is on your mind. It is a well researched and long proven fact that the quality of your marriage is actually decided in your first 10 years of childhood. For those of you who are surprised by this, look at what neurological scientists have discovered about the brain over the last 15 years. Their research shows that the brain is the only organ that starts large at birth, and then shrinks with age. This shrinking is created when "synaptic connections", (these are brain cells that connect to other brain cells) which number in the billions within the first three years of life, begin to die off. But here's the interesting point. The synaptic connections that remain are the ones that are secured by the behavior of the adults who raise you. Those brain cells remain because they live on to carry your instructions on how to live life. If your parents were frustrated and angry people, these are the "instructions" you have on how to deal with situations. If they were calm, pleasant and rational people, you are now carrying around in your brain, the instructions that allow you to instantly handle situations in the very same way. Now it's time to be an adult and get married. As it turns out, most of us wind up looking for what we don't have ourselves, and we do it without any thought. A softhearted woman looks for a man with strength, only to find one with a hot temper after they're married. A quiet, keep to himself guy finds great attraction in an outgoing funny girl, only to learn that she wants him to love the social life like she does. The greatest marriage advice I can give you after 14 years of working with married couples is to find out all about the childhood of the one you intend to commit to. What you're after specifically is to find a man/woman who had a good father in those first ten years. The ideal father is a dad who took a genuine interest in all the things that mattered to his child. Your best choice in a spouse is a man/woman who would rate their dad a 90% to 100% on a "good dad scale". What you get when you find the son/daughter of a really great dad is emotional stability. That means he/she is able to stay calm, rational, clear headed and productive when discussing difficult topics. The greatest marriage advice you'll ever get is to ONLY marry the product of a great dad. 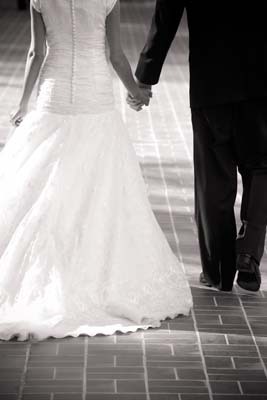 IF YOU'RE ALREADY MARRIED: Once you marry, this advice changes radically. You read the above answer and realize "Hey! I didn't marry the product of a great dad!" Here's an interesting research fact for you. Of all the people who have gone through my marriage course, 98% of them have at least one member of the duo who comes from troubled fathers. More to the point, I have virtually NEVER had a couple come to me with marriage problems, when BOTH of them came from great fathers! What a wakeup call! If you want to know more about Real Dads, do a Google search for The Secret Of Becoming A Real Dad. You'll find an article with more insight about what amounts to, the most important marriage advice you'll ever get. And if you would like to understand more about how your brain was formed by the adults who raised you, you can get a copy of my special report, "Your Invisible Lifestyle: Is It Helping or Hurting Your Marriage?" by doing a quick search on Google for that title.